Winter weather is here and I’m ready to cozy up on the sofa with a comfy throw! One of my very favorite “comfort activities” on a dark, cold winter night, is to cuddle up under a cozy throw, with a fire going in the fireplace, a cup of hot cocoa in my hand and a good movie on the tv. Pure bliss after a long day. Even when not in use, having a throw or two draped across a chair or on your sofa, screams instant cozy! 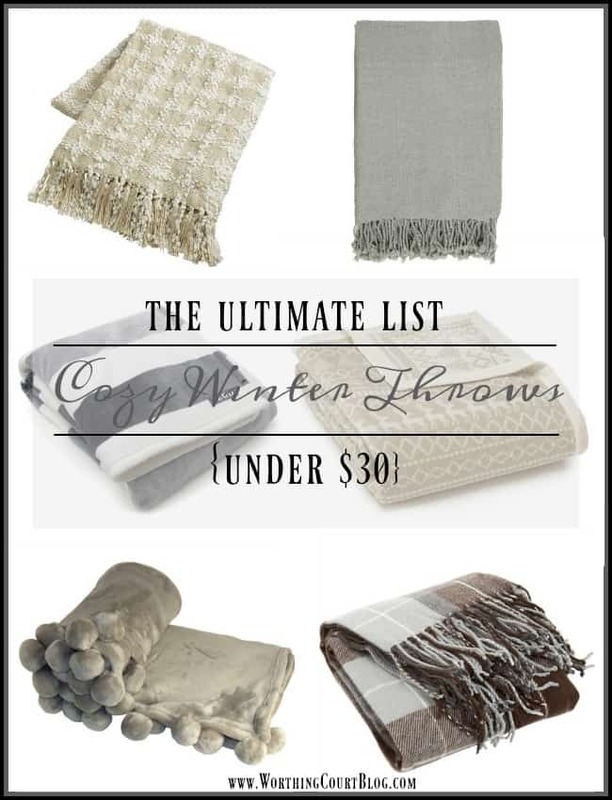 So, in honor of the cold temps, I’ve rounded up 12 of my favorite cozy throws for you. They’re all in neutral colors, so they’ll go with any decor. And bonus! They’re all under $30! CLICK ON THE NAME OF THE THROW WITH THE CORRESPONDING NUMBER DIRECTLY BELOW THIS IMAGE TO VIEW. I would happily cozy up under any one of these! Do you have a favorite? I love the look of most of these throws, however they are not conducive to keeping anyone in my home warm We’re all close to 6 feet and taller. Any pretty blanket suggestions? I usually end up making an afghan in the new style of the year, which I enjoy, but don’t always get it done before warm weather sets in again…..lol. The Alpine throw looks so warm and cozy to me. They are all beautiful but love the Alpine throw. Love to cuddle up with a throw, pug on my lap and read or do needlepoint next to our pellet stove. Bring on winter! What a great round up! Love having throws easily accessible this time of year. My husband gave me a fur throw for Christmas. It looks like mink. It is a whopping 60″ x 70″ and is so warm. I spent two days under this watching old 1939-1956 movies. Those were the talented actors and actresses and were about love and warm themes (not like today movies). I had just been thinking that I needed to find a couple of new throws for my living room when I saw your article. I promptly ordered a beautiful Martha Stewart plaid to snuggle under while I watch TV in my rather chilly 100-year-old house. Thanks for the shopping suggestions! Some super cute and cozy looking ones. I am in love with #1, #2 & #7!!! I just might have to go shopping…. I am a fan of the throw too! Not too many nights pass without me snuggling underneath one! I have throw #10 , from Pier One, and it initially was gorgeous, but after washing, it never had the same feel. I was disappointed and would not recommend. Throws need to be washed as everyone in the family uses them- sometimes even our furry family members! Great roundup! I’m a sucker for a good, cozy throw. My favorite would have to be number 5. I really like #1 because of the Buffalo Check print. After years of having the same throw on my couch, I just recently bought me a polyester throw for my family room and I love it. It feels so soft. The colors are blue, white, with a touch of green which are perfect for the room. Love 3 and 6… and 3 is for two at $21.00!!! That’s crazy affordable! Different colors, too! Love these…..especially the Pom Pom one! So cozy. These all look so comfy and still beautiful – my favorite is probably the Brandon gray and white stripe – would go well with our current color scheme. Today’s a good day in Virginia for a cozy blanket with all the snow we are getting. They all look so cozy and warm. Perfect timing! I just changed my ground floor to all grays and whites! I’ve been search for a few reasonable priced throws. I’m all about lots of blankets!! Everybody has to have one~I really want to build a DIY ladder and replace some of my blankets, now you’ve given me lots of options!! My favorite is the Reversible MicroMink Faux Sherpa Throw from Macy’s is my favorite! I love cuddling up next to the fireplace with a soft blanket! I have #10 and can vouch for its coziness! Next to pillows, throws are my second obsession. I love the texture they bring to sofas, chairs, beds. You rounded up some great ones … hmmm, I may need to add to my throw collection!! Thanks for a great post! Warm coziness. Ordering the pompon one. I like the pompon one also. It gives a little texture to the couch! Love your blog. You have a beautiful home. I may have to buy one of these throws. So many to choose from! 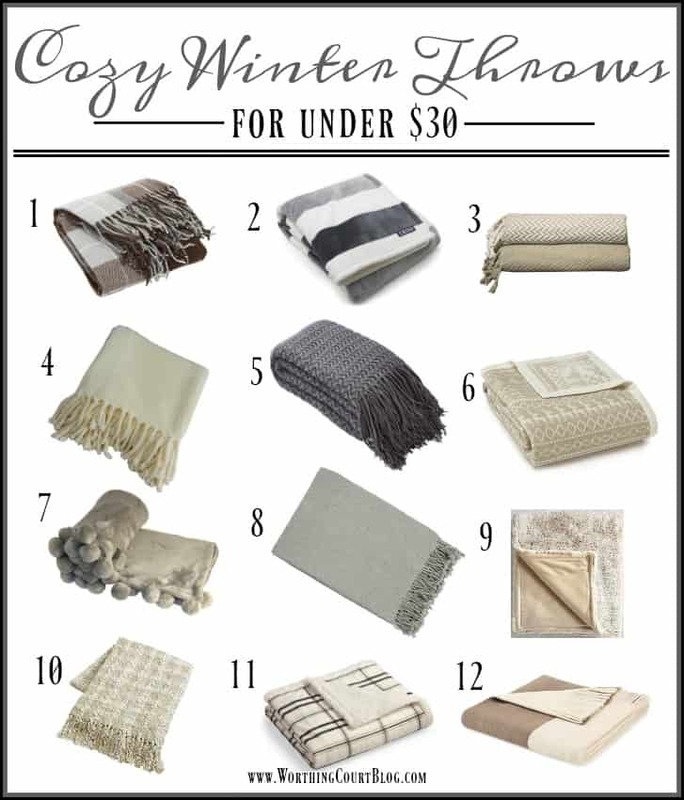 I love the Alpine throw— hubs got a similar one for me at Sam’s before the holidays, 60×70. I love your blog! Looks warm and cozy! Thanks for the links. Okay! You’ve tempted me to get out & find another throw. One of our kids gave us a real expensive knitted one from a high end store, but it doesn’t keep in the warmth like several others that we have, doesn’t do the layering process well! =(. I guess it’s the fabric because it is not an open weave … so where/when I can, I want to test the warmth, soft feel … !!! Thanks for this great line-up, SUZY! 5 or 6 “X clicks” ~ frustrating to say the least! If there is anything to be done … just thought you should know! Really like your blog ~ you are one. talented. lady.